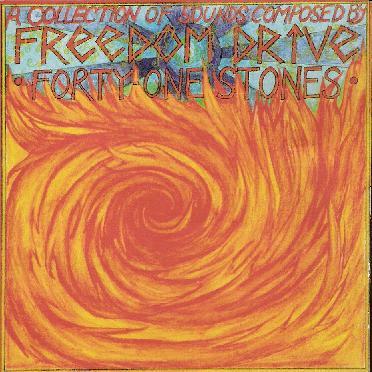 Freedom Drive - "Forty-One Stones"
The Leeds based trio Freedom Drive excel at merging classic 70's style rock songs with experimental soundscapes and psychedelic freak outs to create an at once familiar and at the same time unique and fresh sounding kind of music. It's not unlike what the Grateful Dead did for years, but with far less country twang and laidback Marin County groove and far more heavy rocking and definitely more spaceiness to the proceedings. Through the first few listens, I felt that maybe they could stand for a bit stronger song writing. But the melodies and riffs grow on you, and eventually become so seductive that you can't resist them. That to me makes the best kind of music. The kind that doesn't necessarily strike you right way, but creeps up on you, and with every listen, you peel away the layers to discover new things to delight your ears. I like the way the band careens from structured songs into spacey chaos and back again within the course of a single track. I also like the way that even during the more structured parts, the psychedelic trippiness often continues to slide along underneath. And while there are dashes of Pink Floyd and much more than a passing nod to Led Zeppelin, Freedom Drive, even on their debut, are grasping towards their own sound, especially in their more freaky sonic explorations. Whether they are rocking out with abandon, playing mellow psychedelic blues, or jamming somewhere in outer space, Freedom Drive deliver. For more information you can visit the Freedom Drive web site at: http://www.myspace.com/freedomdrive.